New developments in the observation of supernovae are providing increasing evidence that the explosion of a star can result in a strongly deformed fireball. The image above shows a Ib supernova 2010O is thought to be an explosion in a Wolf-Rayet X-ray binary. A few, rare supernovae arise as a result of the interaction of white dwarfs with other stars placed very close to them -the so-called thermonuclear supernovae. Other explosions, core-collapse or gravitational supernovae, happen when very massive stars die (like the Wolf-Rayet Star remnants above). These stars have consumed the fuel that makes them shine, the energy source that supports their internal structure against the tendency to shrink and collapse due to the pull of gravity. They suffer an energy crisis that leads to an extremely violent collapse and, after that, to an explosion of awesome, apocalyptic finality. Type IIn gravitational supernovae are the rarest of all, with only three of this type ever observed; in all three cases astronomers found strong evidence of an asymmetric fireball . The most recent of these studies was conducted by an international team of astronomers lead by F. Patat (ESO, Garching, Germany), who observed supernova 2010jl in November 2010 using Calar Alto telescopes and a technique called spectropolarimetry, which allows to infer information on the shape of an object, even though the object itself appears as a simple, tiny point at the telescope. Supernova 2010jl was observed in the constellation Leo some 160 million light-years away during the first days of November 2010. 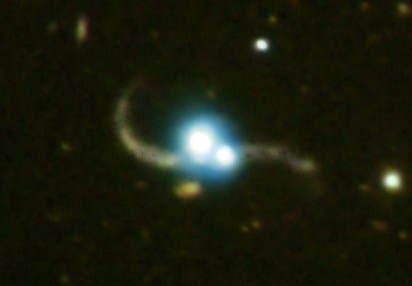 Its host galaxy was UGC 5189A, a strangely shaped specimen, an example of a galaxy in strong tidal interaction with some neighbouring galaxies. Such interaction usually leads to an intense formation of new stars, the more massive of which later will appear as gravitational supernova. In the case of SN 2010jl, it has been estimated that the parent star had a mass at least around thirty times that of the Sun. Such heavy massive stars drive consume their resources rapidly and shine only for a few million years The intense energy output tears material out from the stellar surface. So, the star is continuously emitting not only energy, but also some amount of matter, atomic and subatomic particles that constitute the stellar wind and form an envelope around the star. When the final moment comes and the star explodes as a gravitational supernova, the expanding fireball collides with this envelope, and emits light due to processes that happen both inside the hot gas and at the contact surface between the hot gas and the envelope. In SN 2010jl the asymmetry caused by an intrinsically non-spherical explosion, or a more symmetrical fireball interacting with an elongated envelope-the team is not sure. In either case, both the explosion and the envelope come from the same almost spherical star. Rotation and magnetic fields are no doubt involved in the generation of the asymmetry, but further studies are needed to clarify this point.